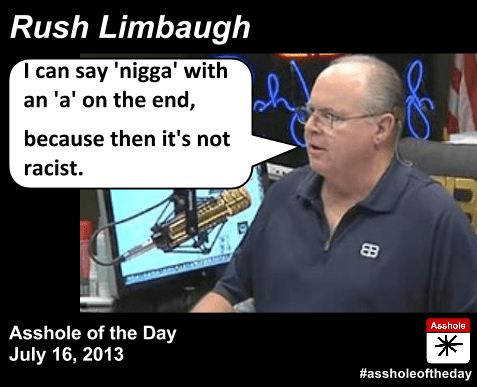 Excrement In Broadcasting: Rush Limbaugh finally feels free to use “the N word” | Name-Brand Ketchup. ← Another reason the RepubliCANTS are trying so hard to stop ObamaCare. Last week, felonious drug-addict draft-dodger drama-queen Rush Limbaugh started saying “the N word” on his douche-canoe excuse for a radio show. Why? Because Trayvon Martin’s friend Rachel Jeantel, a black teenager, said it recently in a radio interview. Plus he has to give all his douchey listeners something new each day to get their Depends in a wad about. What a relief it must have been for Rushbo to finally.. finally.. crawl out from under the burden of repressive political correctness and speak his mind unrestrained for once. He’s been so well-behaved for so long, after all. And see? He said it with an “a” at the end! Just like black folks on the street! So he’s not racist! So stop saying that! I fully expect this Rush wannabe to follow suit any day now. Not long ago I provided my take on Paula Deen’s poor choice of words. And last week a very thoughtful poster named Tommy Carcetti posted these thoughts on Democratic Underground. It’s so good I’m posting it verbatim. Go to the link if you want to read the discussion that followed. As a white guy, I’m perfectly fine with the fact I can’t say “the N word.” Even if black people can. I’m perfectly fine that there’s no White Entertainment Television. I’m perfectly fine that there’s no White History Month. I’m perfectly fine that colleges don’t have White Student Organizations and that there’s no National Association for the Advancement of White People. All this ridiculous whining and consternation from some white people that they don’t “get” the same cultural markers as black people or they don’t get to say certain terms about African Americans even though blacks use that same term. It’s ridiculous. It’s insane. You’re forcing the issue and you ought to give up, because you look like fools. Let me tell you something. If for the first century of this country’s history white people were considered property and not full human beings, and for the second century of this country’s history white people were subjected to institutionalized segregation laws, and for the third century white people had to deal with the lingering after-effects of the first and second centuries, then all of those things would be perfectly okay for white people. Most African Americans in this country have had a shared cultural experience, one marked with both great trauma and overcoming such trauma, that allows them to identify with each other as a race. White people in this country have never had that. Not as a race. Many of us have a cultural identity with the country in which your family has its origins (Italian, Irish, Polish, etc.) and that’s terrific. Because when the Italians and Irish and Polish crossed the ocean to this country, they too had a shared cultural experience in that aspect, and that’s something you can pass on to future generations. But there is no “White American culture” to speak of in this country. It’s a myth. And that’s perfectly fine with me.